Food distribution at the Murphy Canyon Military Housing Area by Jewish Family Service’s Hand Up Food Pantry. Last week marked the end of Hunger Action Month, a nationwide initiative to bring awareness to the widespread hunger that exists in our communities. Nearly 50 million Americans face hunger. In fact, some data indicate that the United States may actually have one of the worst hunger problems among all wealthy countries. San Diego is no exception. According to a recent study by Feeding America San Diego, one of San Diego’s two food banks, 473,500 people across San Diego County seek food assistance from just this one food bank every year. That’s nearly half a million people in our community who do not have enough food to sustain themselves — and this number doesn’t account for the thousands who receive food from providers outside the Feeding America network. Nearly three quarters of people receiving food assistance from Feeding America need it regularly. The majority of people receiving assistance come from households with at least one working member, and 27 percent of the households Feeding America serves include someone who is currently serving or previously served in the military. The story that these statistics reveal is one of hardworking members of our communities — our neighbors, friends, and even those fighting to protect our freedom — who simply cannot make ends meet and are forced to make difficult choices between food, housing, medicine, and education; choices none of us should have to make. Fortunately, hunger is a solvable problem, and our elected officials are listening and responding to what we are saying about how people across San Diego County are being affected. 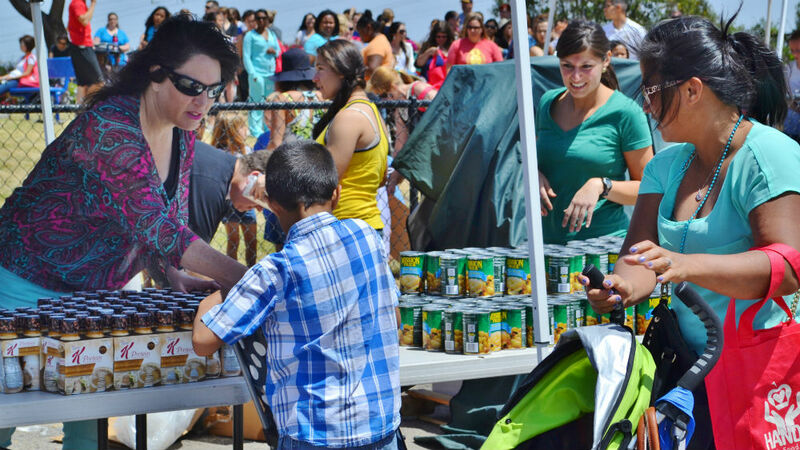 This Hunger Action Month, San Diego County and the cities of Escondido, Oceanside, San Diego and San Marcos each issued proclamations recognizing Hunger Action Month, in addition to Congressional Representatives Susan Davis, Scott Peters, and Juan Vargas. Other elected officials showed their support on social media. These public examples of support are important as we seek to change the conversation about hunger in our communities — for too often the hungry in our communities are vilified and marginalized. Hunger affects all of us. Last week also marked the last day for Gov. Jerry Brown to sign or veto bills passed by the California Legislature. Bipartisan bills to reduce hunger among pregnant women and college students were signed into law, along with the creation of an Office of Farm to Fork. Unfortunately a bill supported by every one of San Diego’s state elected officials to strengthen the connections between access to healthcare and healthy food, and reduce government inefficiencies, was vetoed by the governor. In addition, earlier in the year, the state passed a budget that stepped up to ensure that thousands of hungry Californians would not face cuts to food assistance put in place by the federal government. I am proud to live in San Diego, where our elected officials have shown dedication to ending hunger in our communities, and I am proud to be part of a network of non-profit organizations that fight every day to end hunger in San Diego. As this Hunger Action Month and this legislative cycle end, though, let us not forget that there are 473,500 reasons that more work needs to be done in San Diego. Kristen Aster is Manager of the Hunger Advocacy Network, a collaborative of 21 San Diego organizations that work together to achieve a long-term, systemic reduction in food insecurity in San Diego by shaping state policy. Learn more at www.hungeradvocacynetwork.org.